When Will I Get My Nate’s Coffee? Nate's Coffee roasts every order fresh as possible. Most coffee roasts Monday through Thursday and ships on Thursday or Friday. Orders placed Thursday through Sunday will be roasted and shipped the following week. All coffee is roasted to order. If you find for some reason that you are dissatisfied with your purchase please contact us so we can remedy the situation. 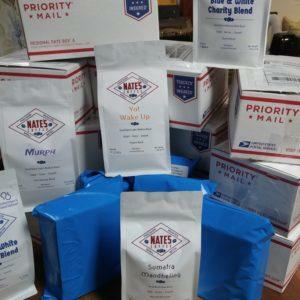 Nate’s Coffee strives to provide the highest quality coffee, roasted in small precise batches. There may be many other options for coffee in this world but few can compare to Nate’s Coffee. Try us and find yourself pleasantly surprised. What’s in the Price of Coffee? National Margarita Day – Nate’s Coffee Style! Copyright © 2019 Nates Coffee. Powered by WordPress. Theme: Spacious by ThemeGrill. Corporate Gift Decisions? Try Nate’s Coffee! Epping’s has Nate’s Coffee back on National Avenue! Endless Summer Paddle & Coffee Company serves Nate’s Coffee in Louisville, KY!